How do you stay healthy during the holidays? You stay healthy by making sure you have plenty of healthy choices on the table and by continuing to move your body even when you can't make it to the gym. Today we are going to discuss healthy choices. I have assembled 3 recipes that you could share with your family and friends. I also want to discuss a few tips to make it easier on you to make the right choices during gatherings that are focused on food. This year my daughter is taking over all cooking of items that are not plant based. At first I took it as an insult that my kids think I can no longer cook a delicious Thanksgiving meal because I eat a plant based diet. Then I realized that this was a blessing in disguise. I am only responsible for foods that are healthy and that I can eat. I am making vegan mashed potatoes, salad, vegan stuffing and a vegan dessert (that I will share with you). So my tip for you is to make plenty of dishes that are healthy as well as the family favorites. Eat less of the family favorites and more of the healthier dishes. If you are not responsible for all the cooking then ask to make dishes that you know you can make healthier and that everyone will enjoy. Sometimes a family favorite can be a bit healthier with just a few tweeks and none would be the wiser- for instance, my mashed potatoes are vegan and delicious and no one will even notice. My stuffing is made with veggie broth and no one will know the difference. My pumpkin mousse is awesome and no one will know that it is vegan- well my kids will because I am eating it, but if you make it for your family I promise they won't know. It is the little things. Put out a tray of cut up fruit for snacks, cut up veggies with hummus. Fill up on those rather than chips and dip. Ok, let's get to the recipes. I chose a salad, a dessert and a smoothie. 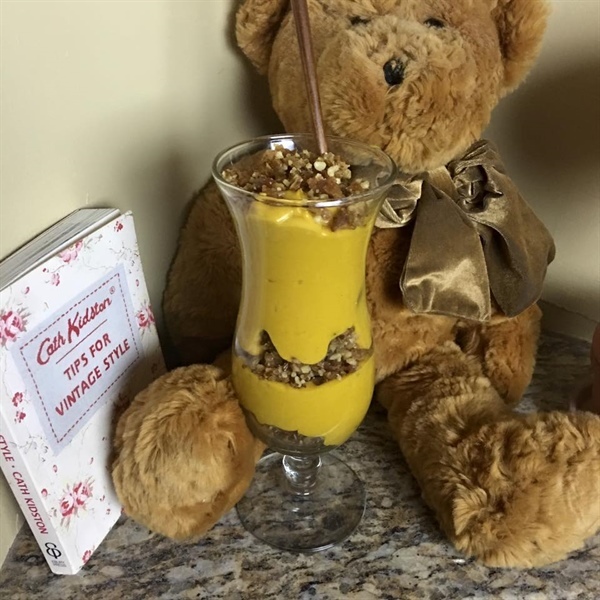 The Pumpkin Pie Smoothie (pictured above) will make the perfect breakfast to start your day. You could add greens if you want and I promise you that you will not taste them. Blend down the greens first with a little bit of water and then add the pumpkin and the rest of ingredients. You will need to double the recipe if you plan on serving to more than one person. The single serving in the recipe makes 1 qt. 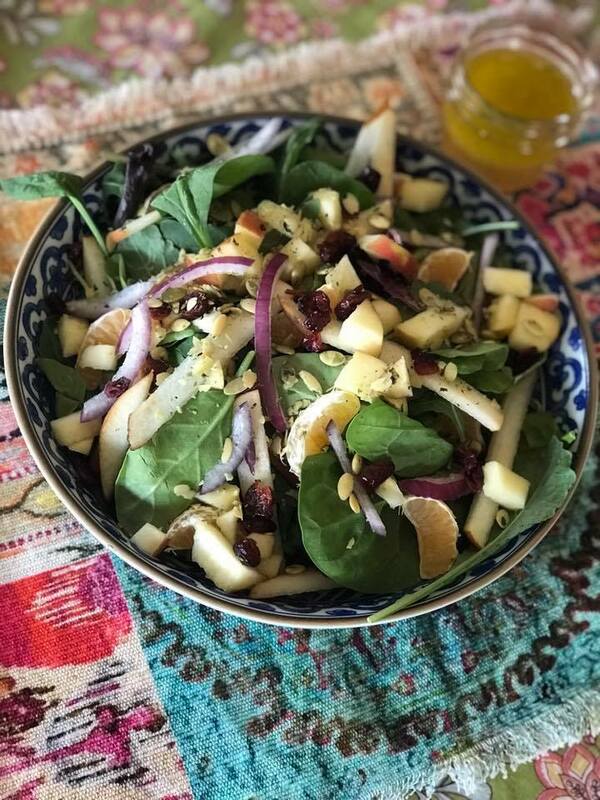 The Fall Salad with Pear Vinaigrette will be the perfect addition to your holiday meal. It is full of all of the flavors of Fall. It is easy to make and I guaranty it will be a show stopper. The final recipe is my Pumpkin Mousse. It is easy to make and delicious! My last tip is to get a walk around the block in during the day or a Turkey Trot. Find ways to be active: dancing, a friendly game of football in the back yard- or even frisbee!